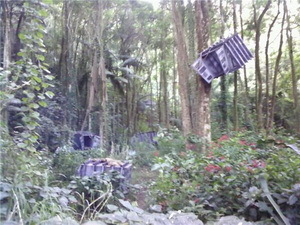 Potentially the first set pictures from Predators have been posted in ForumsHawaii. The poster claims he worked as Security on the movie when they were shooting in Hawaii last year. 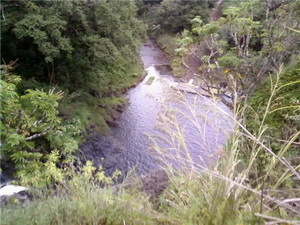 The first picture is at the top of a waterfall and the other two are of the dog cages with what could be a parashoot on top of one. The pictures seem legit. It fits in with the story for those that have read the script. Thanks to Keith for the news. Are we really dissing the CRATES? In Val Verde no one can hear you scream. Did you really complain about the film due to some tiny image of a crate? Wow. Pathetic. It was already established it was going to be a jungle planet. What else would it look like? These are just amateur shots, it'll look much better through a camera. SPOILER.. 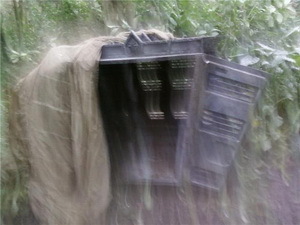 The cages look kinda like they could be what the cast will be dropping onto the planet in and not for the doggies.. These pics tell nothing about the movie at all. When they start releasing actual footage then we can all judge. I'm worried they spent all the money on the cast. I still have a lot of hope for this. Judging by those crates this movie will be a total disaster, I don't even know where to start, but for the love of god, THOSE CRATES!! Page created in 0.032 seconds with 32 queries.